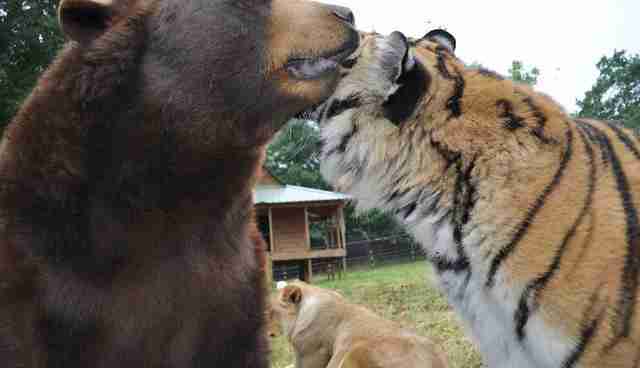 Noah's Ark, a non-profit animal sanctuary in Locust Grove, Georgia, is home to the most animal-friendly BLT imaginable: a lion, tiger and bear trio (known collectively, as you might've guessed, as BLT.) 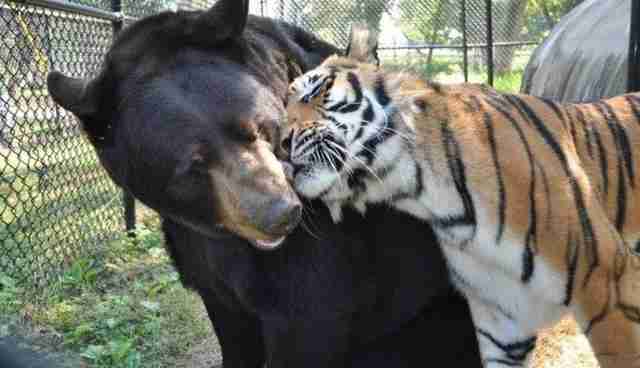 They all live in the same enclosure and exhibit some of the most intense interspecies love we've ever seen. 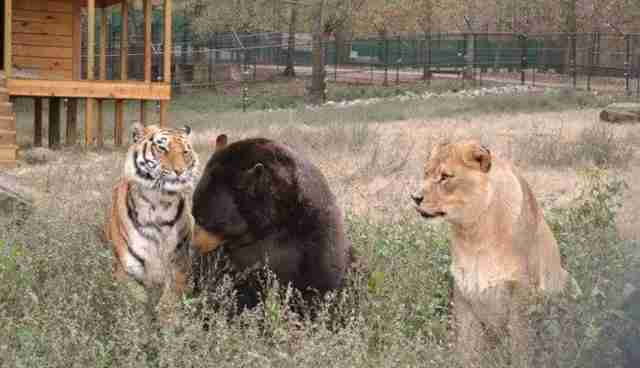 The three are the only known lion, tiger and bear to live together in harmony outside the Land of Oz, but it's not surprising. 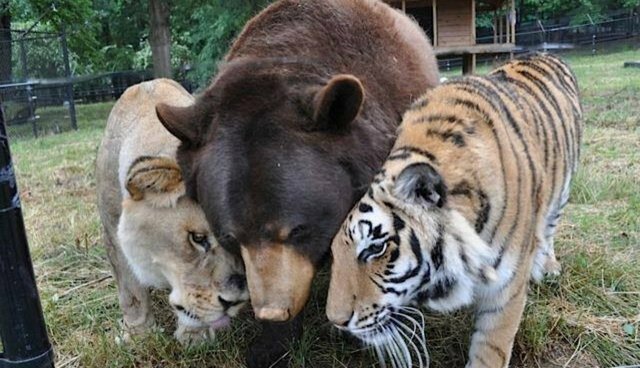 As My Modern Metropolis explains, Baloo the black bear, Leo the lion, and Shere Khan the tiger were rescued from the same horrifying conditions in an Atlanta basement during a 2001 drug raid, and have overcome the same difficult obstacles together. Each animal was afflicted with his own set of injuries due to the abuse and neglect of the drug dealers they had belonged to. 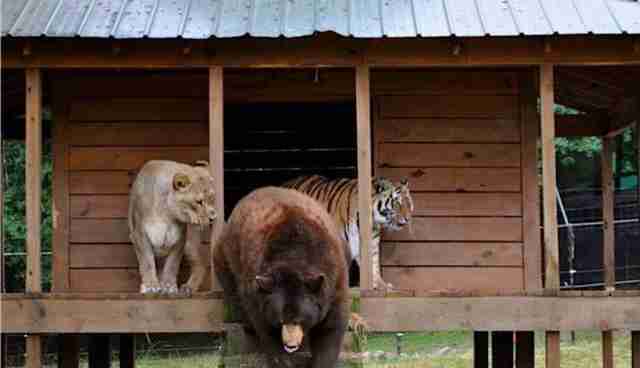 Shere Khan the tiger was underweight and malnourished. Leo the lion had an open, infected wound on his nose from being cruelly confined to a small crate. 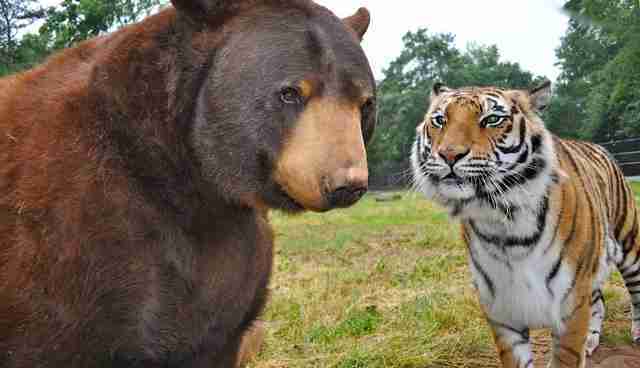 Baloo the bear was in the worst state-he had a severely ingrown harness digging into his flesh because it was never loosened as he grew in size. The harness was so ingrown that his flesh had begun to grow over and around it, and surgical intervention was required to remove the harness and clean his deep, infected wounds. 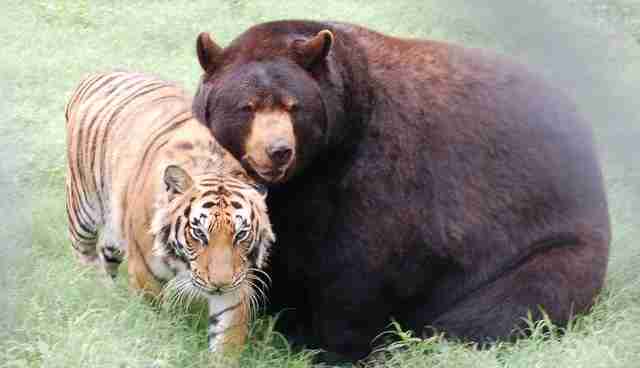 Baloo's surgery was the only time that BLT has ever been separated; during that period, both Leo and Shere Khan were agitated as they waited for the missing member of their family to return. 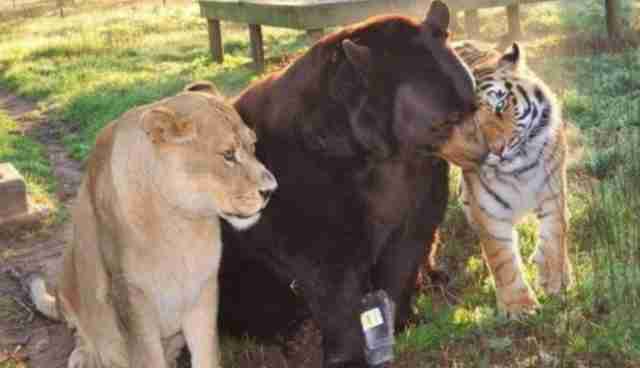 Baloo, Leo and Shere Khan have all recovered fully in the decade-plus they've spent at Noah's Ark, and the three have only grown closer with time. They are, truly, a family.